THEaward-winning Avenue Shopping Centre in Newton Mearns is in pole position for Father’s Day celebrations by giving shoppers a chance to win vouchers worth £100 for four track experience sessions for dad and his friends at ScotKart indoor kart racing in Glasgow. Michelle McCabe, centre manager at The Avenue Shopping Centre in Newton Mearns, said: “This competition is a great way to give your dad a Father’s Day present he’ll never forget – a chance to experience the world of competitive motorsport and challenge his friends to a full throttle race to the chequered flag! 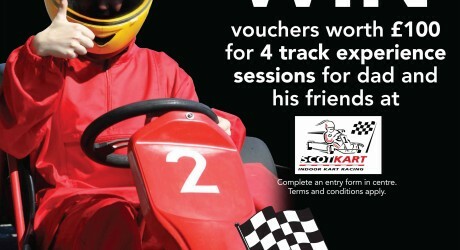 For a chance to win vouchers worth £100 at ScotKart just pick up an entry form at The Avenue and fill in your details.